Pyroxene is any of a group of dark, dense, rock-forming silicate minerals rich in calcium, iron, and magnesium and commonly found in basalt. Pyroxenes are monoclinic or orthorhombic, have a chain structure, with prismatic cleavage close to 90°, and are related to the amphiboles. The group includes augite, hypersthene, and diopside, with composition varying as a mixture of FeSiO3, MgSiO3, and CaSiO3. 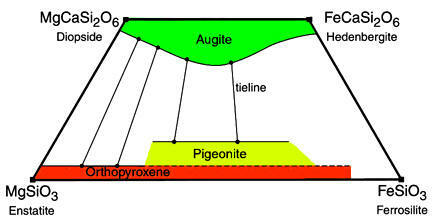 Pyroxenite is an igneous rock composed largely of pyroxene. Jadeite and spodumene are commercially important. Hardness: 2.3–4; relative density: 5.5–6.